New nanoceramic intervertebral disk implants fuse with the bone and are not rejected by the body. According to preliminary estimates these prosthetic implants will be 10 percent of the price for the metal or polymer equivalents thanks to their lower material intensity. Scientists from the Medical Materials at Tomsk State University and the Laboratory of Nanostructural Functional Materials at the Institute of Strength Physics and Materials Science have developed nanoceramic intervertebral disk implants. Their expertise has contributed to the invention of a unique material. In its composition, this porous bioceramic material is extremely close to human bone. The implants have a special bioactive coating that promotes cell growth and ensures that the bone grows into the cavity of the endoprosthesis. They fuse with the bone and are not rejected. This material can also be used to replace damaged small joints of the hands and feet and in craniofacial surgery. Tomsk scientists are convinced that their brainchild will be able to help millions of people all over the world. 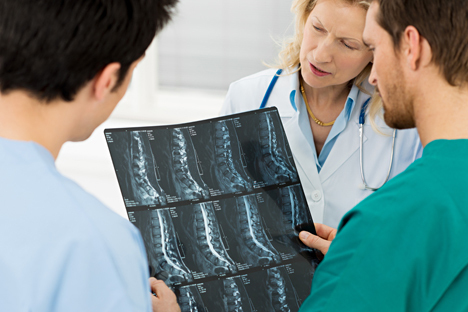 A herniated disk (HNP) is one of the most widespread ailments on the planet. The most common treatment for it now is a metal or polymer implant, which can cause inflammation or destroy the bone. A porous bioceramic cage is installed between two vertebra and fuses with them, which makes it possible to reduce the risk of complications and repeat surgeries. The Siberian scientists’ work has drawn interest from their foreign colleagues. An international medical materials laboratory comprised of experts from Russia, Germany, Britain, Italy, Greece and Hungary has already been operating at Tomsk State University for a year. One of the results of its work is cooperation with the University of Cyprus. Joint research with scientists from this university has shown that under certain parameters of the porous structure of ceramic samples, cells that are seeded on their surface begin to produce calcium phosphate compounds. This material is a likely candidate to become a natural bone substitute. The first prototypes have been created and the team is now researching biological cell response and establishing an implants’ maximum strength and elasticity. This work is being done with participation of the Federal Research Center of Transplantology and Artificial Organs, the Novosibirsk Institute of Trauma Surgery and Orthopedics, the Tomsk Regional Clinical Hospital and the Russian Academy of Medical Sciences’ Institute of Oncology. Implants will be made at NEVS-Ceramics, a vacuum tube plant in Novosibirsk. “In our estimates, porous bioceramic implants will cost approximately ten times less than the existing foreign equivalents thanks to their lower material intensity,” Kulkov told RIR. For instance, he said that a set of small joint implants now costs an average of about $1,100, whereas a Russian porous bioceramic set will cost from $56-93, with their production in Russia amounting to about $74 million. Independent scientists, however, are cautious in their assessments. They want to see how well the geometry of artificial vertebra will be developed and whether bioceramic implants will be rejected by human tissue.